which concluded that using third party tools to do the migration to SharePoint Online is a much easier process that any other option. The drawback with most third party tools is that they are quite expensive, especially for smaller businesses (generally talking thousands). 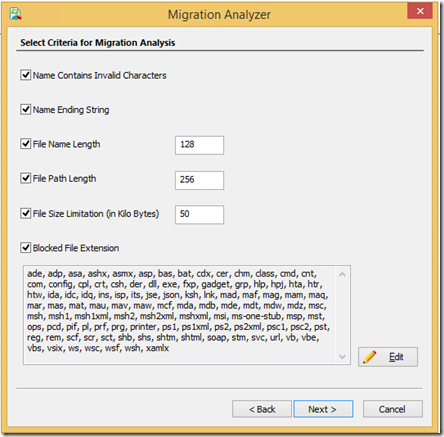 I have always been on the hunt for a suitably priced SMB SharePoint migration tool and recently was contacted by Ajit from Lepide who kindly provided me with a copy of the LepideMigrator for documents software. You basically set up your source locations. 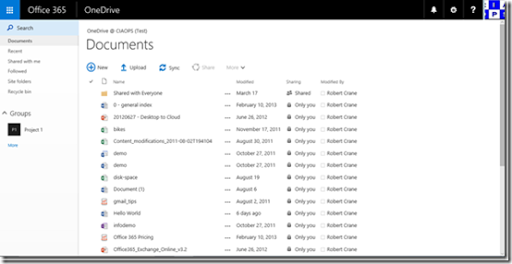 Then your SharePoint destinations, which can include SharePoint Online. You can then migrate or copy from source to destination. What you might also notice here is that there is a Migration Analyser option. SharePoint does have some limitations around certain file names, file lengths, etc. This can prove frustrating if you are trying to a bulk move of files and one of these conditions causes your traditional file copy via a mapped drive to bomb. The built in migration analyser will test your source for all these known condition and alter you if problems exist. That way you can identify and take action on problem files BEFORE you migrate. 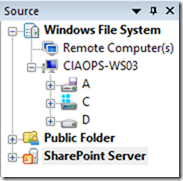 If you need to do SharePoint to SharePoint migrations, say from previous versions of SharePoint to SharePoint Online it will do this as well. It can also read and display things like the permissions of your destination as well as match securities during SharePoint to SharePoint migrations which is really handy. Now for the best part. The cost of this tool is only USD $349 for a one year subscription of a single seat license. You can add additional seats for USD $175 and each subscription includes free support and maintenance. That is outstanding value for what the tool does, especially when compared to other offerings. I think the LepideMigrator for documents software is an excellent choice for small and more cost conscious businesses looking to move data into SharePoint online, whether from a file system or from something like Companyweb. They also have a reseller program that provides further benefits. With the LepideMigrator for documents software I successfully migrated files from a local hard disk to a SharePoint Online Document Library, a complete site from a SharePoint 2010 hosted environment to SharePoint Online and finally across different SharePoint Online tenants. That probably covers the majority of what most smaller business need when they move their files to Office 365. Lepide also have a number of other products that, based on what I have seen with the SharePoint tool, I also suggest you go and check out. Once again, thanks to Ajit from Lepide for reaching out and letting me test a full version of their software so I could report to you. So, if you have a need to migrate information to SharePoint Online I really suggest you check out the LepideMigrator for documents. It is the most cost effective tool I have currently found, especially for smaller, and more budget constrained, businesses. It showed how to get a personal OneNote notebook up and running with Office 365 and access it on all your devices. It also detailed the process that I use to create my shared ‘Daybook’ notebook which I basically use as a replacement for a traditional pad and pen. One of the must have add-ons for OneNote in my books is Office Lens from Microsoft. The way Microsoft tout it is as a OneNote scanner for your pocket. Once you have the app on your device you can use it capture things like business cards, white boards and even documents. To do this you simply use the Office Lens app to take a picture of the information. Once captured you can then save it in a variety of locations, including OneNote. The way I use it is to capture expenses when travelling as you can see in the above screen shot. Here, I’ve taken a picture of a petrol receipt using Office Lens on my mobile and then uploaded that to my cloud shared OneNote notebook. This then makes that available to every device automatically thanks to the syncing wonders of OneNote. When I return to my desktop, I can bring up the same OneNote notebook and view the receipt. Even better, I can use OneNote pages and sections to categorise the information so I know for example which trip it was part of. Even better, the information inside the receipt has been made searchable. Thus, as the highlight in the above screen shot demonstrates, I have searched for the text ‘invoice’ and OneNote found and highlighted that text inside the receipt (i.e. inside a picture I took on my mobile device!). Can you imagine how much easier it would be to record all your casual receipts like this? Once they are captured with Office Lens, they can be uploaded to you OneNote notebook saved in the cloud. There they are not only backed up and saved, they are also searchable and easily ordered if required. It really is amazing at how well Office Lens works with receipts and whiteboards. Combined with cloud based OneNote notebooks it creates a great system for not only capturing but also retaining and organising information for individuals and also for businesses. 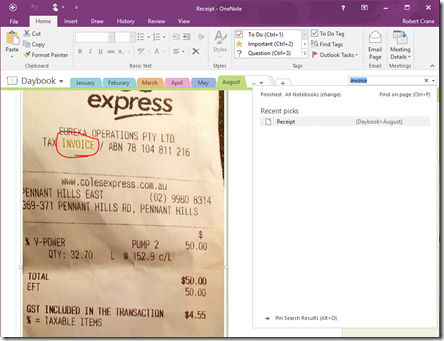 Image a system where travelling staff can capture their receipts directly into OneNote so they can be processed quickly by admin staff back in the Office. Think of how much time it takes you or your staff to do paper based expense reports now. Think of all the space consumed by those paper expense reports. Also, what happens to the receipts after they have been processed? How long do they need to be retained for tax purposes? Many receipts are printed on thermal paper which fades over time. That is not good if they need to be retained. Having a digital copy has so many benefits and combined with cloud based notebooks like OneNote, it can greatly increase the productivity of your staff and your business. 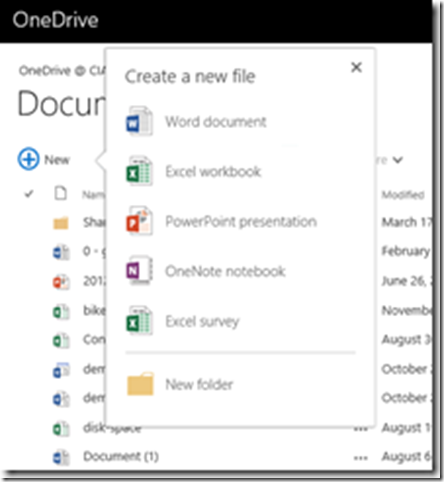 The best bit is that both OneNote and Office Lens are already free and if you have Office 365 or OneDrive.com (also free) you can take advantage of cloud synced notebooks to share the information between devices or between a team. So if you enjoyed my previous OneNote article and are using OneNote synched notebooks, now you can take your productivity to the next level by using Office Lens. You can get even more done in your day by making the capture, retention and sharing of information simple and digital. One of key technologies I tell people, especially resellers and IT Pro to be more aware of is Azure Active Directory. However, many ask where should they start with the product? Free – The Free edition of Azure Active Directory is part of every Azure subscription. There is nothing to license and nothing to install. With it, you can manage user accounts, synchronize with on-premises directories, get single sign-on across Azure, Office 365, and thousands of popular SaaS applications like Salesforce, Workday, Concur, DocuSign, Google Apps, Box, ServiceNow, Dropbox, and more. Basic – Azure Active Directory Basic edition provides application access and self-service identity management requirements for task workers with cloud-first needs. With the Basic edition of Azure Active Directory, you get all the capabilities that Azure Active Directory Free has to offer, plus group-based access management, self-service password reset for cloud applications, Azure Active Directory application proxy (to publish on-premises web applications using Azure Active Directory), customizable environment for launching enterprise and consumer cloud applications, and an enterprise-level SLA of 99.9 percent uptime. Premium – With the Premium edition of Azure Active Directory, you get all of the capabilities that the Azure Active Directory Free and Basic editions have to offer, plus additional feature-rich enterprise-level identity management capabilities explained below. And that obviously the features differ between them as the above table highlights. Theses links point you to the most salient information on Azure AD. So hopefully that gives people enough information to at least get started on the journey of learning Azure AD. I plan to of course write lots more about Azure AD so stay tuned. It probably won’t surprise regular readers of this blog that I’m a big note taker. Where did this start out? When I was at university doing my first degree in Electrical Engineering it was drummed into us during every lab session that lab notes don’t need to perfect, it is far, far more important to capture the information right then and there. My first job required me to complete a regular journal of the work that I performed everyday and have that available at regular intervals for review. All of this reinforced the importance of getting stuff down on paper. Years later I read the book “Getting Things Done” by David Allen and found that it really spoke to my inner scribe. His main premise is that the human brain is designed for creativity not storage, that’s why you need to write things down some where ‘safe’ so you can free up your mind for bigger things. Of course the majority of the notes that I have taken have been paper based. I have used all sorts of time managers and recorders but normally defaulted to a simple blank notebook in which I could express myself in any manner. The down side with paper is firstly, I need to have my notebook on me at all time to capture what pops into my head (and good stuff can do this at the strangest moment). Secondly, I’d write stuff down to remember it and when I needed it I couldn’t find it because I’d written so many more notes since. After a while I also started to accumulate a lot of notebooks which became painful to manage and one of the biggest problems was keeping track of stuff that I needed to do but was a lower priority. In many cases, I’d need to transfer that item to the current ‘to-do’ list on another page which is really just duplication isn’t it? I figured that there must be a better way so I turned to technology. My first real success came with Evernote and what I liked about this digital notebook application was that it was free and worked on all platforms. What I didn’t like about it was the interface. I personally found it a little cumbersome to work around and navigate. I fully admit that perhaps I didn’t invest enough time with Evernote. However, where it really excelled was in the fact that it was supported by a web version. So if I was in front of server that had an error message I could do a screen capture and then paste that into the web version of Evernote (because of course, servers don’t have desktop apps installed on them now do they?). Now when I returned to my office and powered up Evernote on my desktop and the notebooks synced, I had a copy of the screen shot ready to do troubleshooting. The problems with Evernote was that I needed something to manage my daily ‘to-do’ which I never really worked out how to do effectively for me. I tried apps like Remember the Milk but found they really didn’t support the Microsoft and Windows world in which I spent most of my time. That lead me to Wunderlist. Wunderlist, which has recently been bought by Microsoft, worked wonders with my ‘to-do’ management, at least initially. It is available on all platforms, easy to use and allows a good overview of task ‘to-do’ and what has been done. Unfortunately, over time I found more and more friction using Wunderlist in the way I need to capture information. I needed something more comprehensive that just a ‘to-list’. I needed the flexibility of a paper notebook, combined with the digital advantages or Evernote but with the ‘to-do’ management of Wunderlist. Enter OneNote. I had always been a user of OneNote but where it fell down for me was that it had no pure web version. Ah ha, Microsoft fixed that with Office Online available from OneDrive.com and Office 365. Microsoft then made OneNote available on all platforms, such as Mac, iOS and Android for free. That convinced me that I needed to revert back to OneNote as my main note taking medium. However, I still had the problem of my ‘to-do’ list to solve. Here’s what I found works for me. You can do the same using OneDrive.com but I’m going to illustrate how to do this with Office 365 and OneDrive for Business. Login to your Office 365 portal and navigate to OneDrive. Select the New link just below the Documents heading. From the list that appears select OneNote notebook. Give your new notebook a name. Since I am replacing my paper notebook here I call mine ‘Daybook’. You can of course have as many separate OneNote notebooks as you want and I do for all sorts of things. This will open a web version of the notebook as you can see above. Now I will assume you already have the OneNote desktop app installed, most people do and they don;t know it and if they don’t it is a free download anyway. In the centre of the page at the top you will find the text Open in OneNote, select this. If you have multiple version of OneNote on your system you might receive a prompt like you see above asking you which version to use. Here, I’m going o use the full desktop version of OneNote that comes with Office on the desktop so I select OneNote 2016. 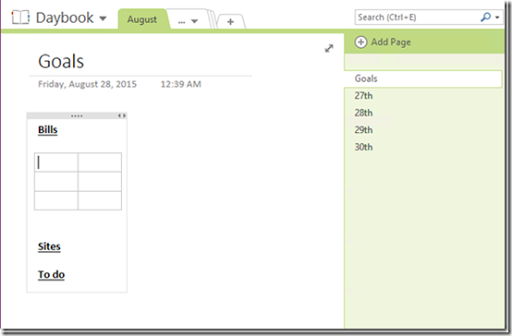 You should now see your Daybook notebook open on the desktop in OneNote as shown above. There is plenty of ways to work with OneNote but here’s how I use it to create a replacement for a paper diary. I create a section at the top for every month as shown above. I then create a new page under each section for the day of the month (do these on the actual day). Thus, I now have a page for every day into which I dump everything instead of writing it down. Every interesting web site, to do item, phone call, etc is recorded here. For example, if someone rings, since I have the OneNote open on my desktop I flip across to it during the call and record the conversation as it happens. After, I can get back to what i was doing safe in the knowledge that I have the information recorded. At the top of every month I create a ‘Goals’ tab that holds things like when monthly bills are due, web sites that I find during the day that I want to file or look at in detail later. I also have my monthly ‘to-dos’ in here. Now that I have my Daybook notebook up and running I ensure that I have it available on all my devices. That means any changes I make on any device are available immediately on every other nice. Nice. Here’s another example of how I use it. Say I have a meeting to attend tomorrow. The night before I create a new page for that day. In there I put the address and the contact details of my meeting. I might also put a map to the exact location or whatever else I need. I’ll also record the train times I need to catch to ensure I make the meeting on time. I usually enter the preferred train but also the one before and the one after. Thus, if I am running late and miss my preferred train I know how long till the next one. Thus, when I get up the next morning I can review these notes and know what I need to do. Alternatively, if they meeting is in the middle of the day I know what time to leave. Sure that same information is in my calendar but it is a good backup and also allows me to record a whole more information and access it faster I find. With my Daybook notebook synced across all my device I can now attend a meeting with nothing more than my phone and know that everything I record will be available on my desktop when I return. I can record text, pictures, web clippings, audio and more directly into the page for that day as one big data dump and sort it out later, much like I did with my paper based notebook. The big advantages I now get is that firstly, everything I enter into my Daybook is searchable (can’t do that with paper) and secondly it is backed up in multiple places automatically thanks to Office 365 or OneDrive.com (again, can do that with paper). From this basic start I now use things such as OneNote tags to categorise material to make it easier to find. I have also created a 13th section at the top called Annual where I have yearly goals or record books I want to read or movies to see. The list is endless of what you can achieve given how flexible OneNote is. That is why I like it, it is so flexible and easy to use. However, what I have detailed here is only how to set it up for yourself. What if I told you, again thanks to OneDrive.com and Office 365, you can share you OneNote notebooks with others? You can allow them to just view or even edit in real time. 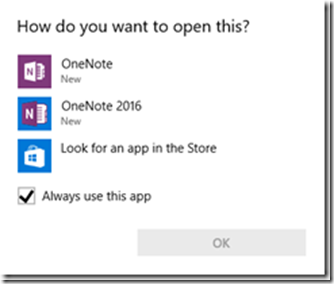 How about a family OneNote where everyone can enter information about what they want at the shops for the next person who goes? What about a business OneNote where you keep track of a project with people inside and outside your business. All possible thanks to the wonders of OneNote. And the best part for you? I’ll pretty much bet you already have OneNote on your desktop and didn’t even realise it. So what’s stopping you having a organised life? It certainly isn’t OneNote. Join me and get more done every day thanks to OneNote. Greg from PlumUC is back again and we are talking Skype for Business as well as a special upcoming webinar we are hosting. Greg and I talk about the updates happening with Skype for Business and the opportunities that brings all businesses. There is going to be a lot happening around Skype for Business in next few months, so if you haven’t as yet taken a good look at what Skype for Business can do then now you should! You’ll also get the usual update on Office 365 news and happenings so tune it and enjoy! One of the topics of late that I have heard a lot of discussion about is how to develop a good corporate culture. There are plenty of books and resources out there that give you all sorts of explanations and suggestions about developing a great corporate culture, however my experience is that they rarely do. To me what works is far simpler than what most of these detail. Good culture is all simply about ‘the team’. This means developing an ethos around the fact that the individuals must grow to focus on the needs of their team mates above their own. Successfully developed, this means that as each individual puts the team first so the team puts the individual first leaving none wanting. It provides the security that you know your team mates are always there. It provides the commitment that the individual must also be there for the team. Building a culture around being a good member of the ‘team’ means developing people who are able to lead and be lead when required without hesitation. It also means being able to support and provide support when required again without hesitation. This focus on the collective good above the individual builds bonds that are extremely strong, resilient and accomplish much more than a group of individuals could. Most importantly it builds trust, a foundation sorely missing in most organisations. The development of a true ‘team’ culture provides a sense of belonging and being part of something bigger, something more important that any individual need. It provides a sense of pride, espirit d’corp that can in many cases rival family bonds. Your team mates are your family, they are your friends, they are your confidants, they will be there when you need them just as you must be there for them, without question, without judgment and without reservation. Everyone wants to be part of a true team culture but creating this takes work. Developing a good team relies on shared experiences, good and bad, for it is through these shared experiences that team members come to understand and appreciate their own strengths and weaknesses along with those in their team. The strength of the team is that they compensate for the weakness of each other so deficiencies are minimised. Their combination provides the strength and the support for members to excel beyond their own limitations. They strive to excel for the team, not for themselves. They strive to not let their team mates down because they know this is exactly what their team mates are doing for them. Developing good corporate culture is not difficult. It is about focusing on developing a true ‘team’ approach within a business, which in essence fosters the devotion of individual to their team mates above themselves. So how do you foster such a devotion and focus on the team? Good leadership, that’s how. Good leaders inspire a team approach and promote trust. Good leaders are the ones who stand up first for the team, they lead by example and through their actions they inspire the best in those around them. Good leadership is not an ability, it is a skill. It can be learned. It can be developed. Good corporate culture is straight forward, finding good leaders is tough. Good leaders are the ones who do for others and the greater good naturally without looking for something in return. They are the ones you need to develop a truly great culture but sadly in today’s narcissistic world these true leaders are few and far between. Thus, if you want a good culture, recruit and develop the best leaders. Not managers. Leaders. Find those who are about others first because without them there is no trust or foundation for a good team. Once you have these individuals the development of the successful team will be so much easier. However, never forget, good corporate culture is always all about ‘the team’ first and foremost. I suggest you have a look at this talk by Simon Sinek to understand more about good leadership that is such a critical part of developing good teams and thus good corporate culture. 5Min Fri (Ep 34): 2015 Fall Conference with O365 Nation from Office 365 Partner Team on Vimeo. Congratulation to Harry Brelsford for now bringing Microsoft in a big way to the Office 365 Nation conference in October. Big news! Watch the above video to get all the details. If you are an SMB Partner then you really should be planning to attend this focused business and technical conference right on the Microsoft campus in Redmond. I will be presenting a number of sessions but see the real value in the hall way networking that takes place. Now with Microsoft being directly involved and having people from the product team also there, I’ve even more excited to attend and so should you be. as well as see all the details about the conference. If you are planning on attending then let me know as I’d love to catch up with people. 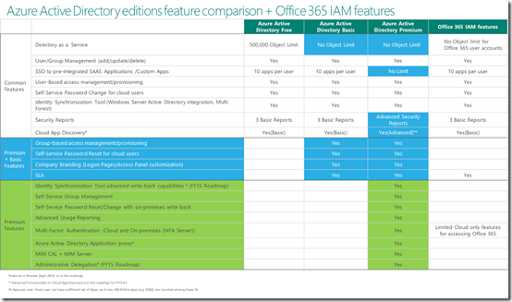 If you have a look at your Outlook on the web experience in office 365 you might notices some differences. Microsoft has introduced some changes to the interface as well as added new features. If you now visit Outlook from your Office 365 web portal and select an email you will see a range of menu options now displayed across the top of the page. You’ll also find new features inside the inbox including the ability to ‘pin’ messages to the top of the list. A new option called Sweep allows you to more easily create rules to manage your inbox. You simply select the message to action on and the select the Sweep option from the menu across the top of the screen. Not only do Sweep rules work like traditional inboxes rules but they also have the ability to run automatically if required keeping your inbox organized when you aren’t there or email are flowing in. Which you should take a look at to see all the new features they are incorporating. Hopefully by now you should bee seeing these new features in your Outlook on web, if not, they will be rolling out to you soon.